Our in-house embroidery service is perfect for promoting your business brand, we pride ourselves on offering a high quality service at an unbeatable price. The low cost of embroidery is an ideal way for developing brand awareness of your products, service or company image. Once you send us your artwork we will email you an embroidered proof for your approval, once you have approved your artwork your order is normally ready within a few days. Larger areas of embroidery on garment backs are charged at £4.95 per garment. 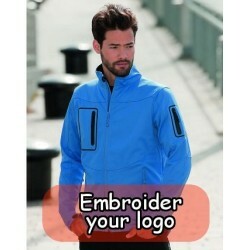 In-house Embroidery ServiceYou can order embroidery online nowIf an item can be embroidered ther.. Product PersonalisationIn-house Embroidery ServiceYou can order embroidery online nowIf an ite.. If this is the first time we have embroidered your items youll need to pay for the origination setup..
Print your logo or photos directly onto garments. At Colbrook we can supply printed a massive r..